Giordani Gold Age Defying Foundation is a very effective foundation product from Oriflame. It is an anti-ageing foundation for a younger looking skin, giving you a brighter complexion. It has a unique formula that helps smooth fine lines and gives you an impeccable looking skin. It is enriched with rare White Truffle extract which has highly improved age-defying qualities. It has a creamy texture. It protects you from harmful Sun rays with with SPF 8. It also helps you keep your skin looking immaculate and young. With this perfect foundation base you can have a perfect makeup. It comes in a 30ml pack. Follow your skin care routine daily. After cleansing and toning apply moisturiser or special skincare treatment product. Wait for a few minutes before applying foundation. 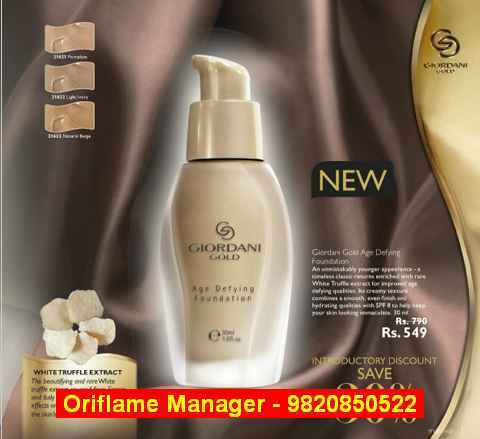 Use Oriflame Giordani Gold Age Defying Foundation to create the perfect base for your makeup. Choose the colour of your Foundation that is as close to your natural skin tone as possible. See the video below to note the steps in applying the foundation. Applying foundation helps you in keeping your makeup fresh for a long time. If you want to make an extra income by recommending skin care products and cosmetics to people in your social circle, you can become a Consultant with Oriflame. You can join Oriflame cosmetics by contacting an Oriflame Consultant you know or by sending an SMS on 9820850522 with your full name, address, pin code, email and date of birth. 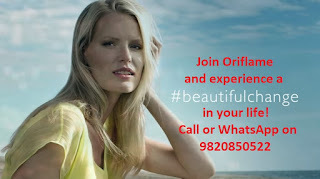 We will help you get started and initiate you sensational journey with Oriflame. On this journey there are a number of tasks you will become familiar with. I am going to teach you everything little by little. The first thing you should do after you join Oriflame cosmetics is to develop a list of your potential customers. These are the buyers whom you're free to show the Oriflame catalogue. Recommend them products centered on their skin type and daily needs. Most of us buy shampoo, conditioner, soap, hair oil, shower gel, moisturizer, nail pait, lip sticks, etc. once in a month or thereabouts. All we need to do once we join Oriflame cosmetics, is to buy products that we were bound to have anyway and buy it from Oriflame and encourage people within our circle to do so and receive some discounts in the process. You obtain a commission for educating your customer, guiding them, helping them identifying a suitable products for solving their problems or fulfilling their needs. Besides commission there exists exciting incentives for everyone. As your guide, I will give you more information about the excellent incentives that you can benefit from when you join Oriflame. I shall also inform you of the brand new Welcome Programme that you may start as soon as you join Oriflame business. Mrs. Jashmi is an Oriflame Manager. She is also an Oriflame Certified Beauty Expert. In April 2011 she received an award for her achievements at a Mega Oriflame event in Mumbai. In September 2011 she was recognized as the fastest growing leader in Oriflame. Her team is spread all across India and many people have got success by following her tips and guidance.